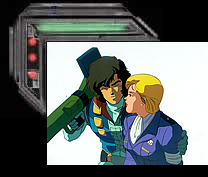 “Crusher Joe” is a 2-hour movie from 1983, which was followed by two hour long OVAs in 1988, “Ice Prison” and “Ultimate Weapon: ASH”. All of them are based on the late 1970s novels by Haruka Takachiho (original creator of “Dirty Pair”). There’s also a dubbed 89-minute edit of the original movie which was released in the UK under the title “Crushers”. Mankind has branched out far into the vastness of space, colonizing and terra forming planets beyond the confines of our Solar System. Space is patrolled, and order is loosely maintained, by the United Space Force. However, founded under the ideology to always help those who are in need, and formed to handle policing, body guarding, and courier jobs outside of the U.S.F.’s control, is the highly trained mercenaries-for-hire organization: CRUSHER. CRUSHER’s top team is headed by its founding member’s son, 19-year-old Joe. Under Joe’s command is a three-man and one robot team: navigator and ex-princess, 17-year-old Alfin; engineer and scrappy fighter, 15-year-old Ricky; main pilot and wise-old-veteran of the group, the 52-year-old cyborg, Talos; and Dongo, the slightly unhinged, high-strung, wise-cracking robot. Together they travel the universe while getting paid to protect the innocent, help the helpless, and beat up on the bad-guys. 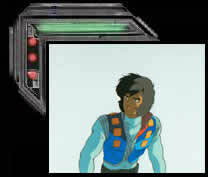 “Crusher Joe” is very similar in feel to the original “Dirty Pair”. What it lacks in pacing and coherent narrative, it makes up for in likable characters, fun friendly banter, ultra detailed mechanical designs, action packed animation, and anime sight gags (keep an eye open for the original Dirty Pair, Gundam characters, and more). Also, despite the lax pacing in the original movie and the first OVA, the last OVA, “Ultimate Weapon: ASH”, has one of the tightest paced, action driven, climaxes in anime. With a time limit of only 20 minutes until planetary meltdown, outnumbered by an evil insurrectionist military, and surrounded by man-eating machines, Joe’s in a race against time to save the girl and ditch the planet.